It was with some sadness that I read the news earlier this week that Thomas Cook are closing the publishing branch of their business, which means the end of the legendary European Rail Timetable, which only this year had celebrated its 140th anniversary. Having worked on the last couple of editions of the Europe by Rail guidebook – which is also a victim of the closure – I had cause in recent years to reacquaint myself with the timetable in all its glory. 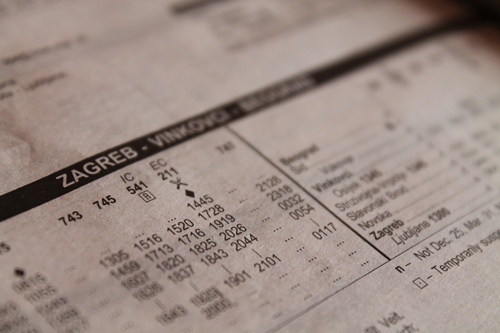 It seems hard to imagine now in this era of extensive internet access and smartphones – in itself a reason why travel publishers have been having a hard time of it – but when I first when interrailing at the end of the 1990s, the printed timetable was the most important part of our luggage. Checking down the columns for the next train from Budapest to Ljubljana, or Florence to Milan, and making sure that it was not subject to any exceptions, or perhaps even a supplement on our rail pass, was an essential part of the routine as we crisscrossed Europe. Beyond simply letting us know how to get from A to B and when, the timetable had some other benefits that perhaps cannot be replicated by online searches in the same way. Flicking through the timetable was like looking at a map, starting your travels in the imagination long before you even step out of the front door. Tracing the finger down the list of stops on any given route often provided inspiration for a stop-off that simply may not have occurred to us without the names laid out in black and white on the page. I can think of a number of occasions, whether Lugano on that first trip, or Sopron on the Austria-Hungary border on later travels, that were directly inspired absent-mindedly flicking through the timetable. Both places retain a strong place in my memory for various different reasons, and I wouldn’t have had those experiences otherwise. So although we do – for example in Germany – have any number of rail-related resources at our fingertips, and the Deutsche Bahn website in particular is a good one, there is something sad about the idea that from this point on travellers will not have the object to cast their eye over all those names, those symbols full of romance and adventure, and imagine where the rails might take them next. My good friends Nicky Gardner and Susanne Kries, for whom I worked on the Europe by Rail project, published an article in the most recent edition of their Hidden Europe magazine which spoke to why will still need printed timetables in this internet age: “Railway timetables are more than a prosaic litany of hours and minutes. They conceal nuggets of social history, and the best of them deserve a place on our bookshelves long after their nominal validity has expired.” I will treasure the copies of the European Rail Timetable that I have on my shelf by my desk, and the memories of so many journeys across this wonderful continent of ours, inspired and influenced by what could be found inside. This entry was posted in Reflections on July 3, 2013 by Paul Scraton. only sadness from an old 50 years traveller since 1980 with always a copy with me.